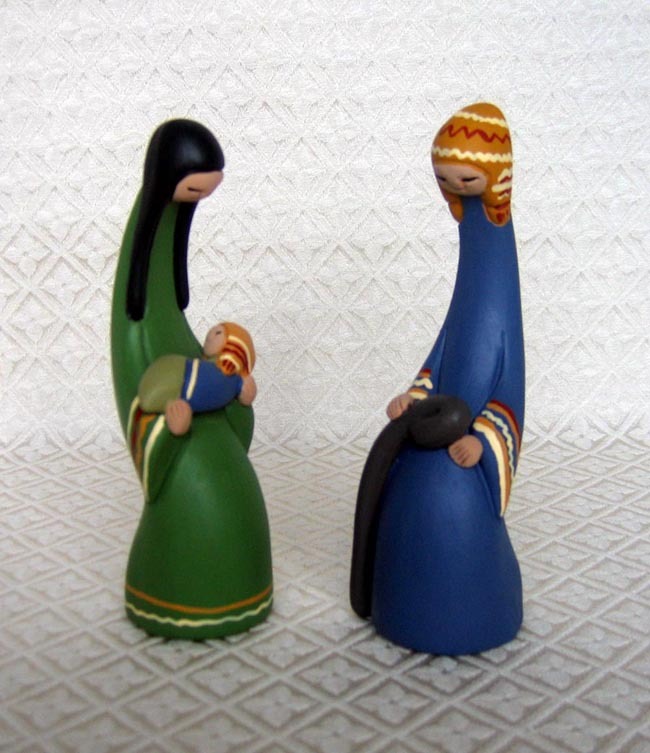 This unique painted clay Nativity features a stylized Joseph and Mary holding baby Jesus. The parents have long necks and bowed heads. Both Joseph and baby Jesus wear chullo hats, a warm knitted hat worn by Peruvians who live in the High Andes. The figures measure 6 inches tall. This item is distributed by Manos Amigas, an organization whose name means “hands joined in friendship.” The organization works with small family cooperatives in Lima and in the Andean highlands. In addition to helping these poor families with employment, Manos Amigas also provides training programs to help strengthen their businesses. As a community outreach program, Manos Amigas donates 20 percent of their proceeds to a Sunday morning breakfast program held at the local church, which feeds up to 400 children from the surrounding community. The money donated to this church program also helps to pay for uniforms and school supplies for the children in the community.